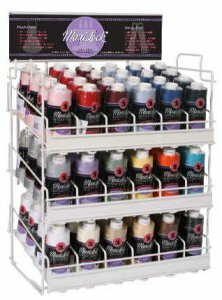 Maxi-Lock Serger Thread is used by major serger manufacturers to test their machines and to demonstrate them in retail settings. That's how highly manufacturers regard Maxi-Lock Serger Thread. Where Maxi-Lock Thread truly distinguishes itself, though, is in the home. Maxi-Lock's soft finish disguises a strength that holds up under the most vigorous seamwork. Maxi-Lock Thread's consistency, beginning to end, makes it easy to set and maintain tensions, which is a major product advantage.